The Green Office Certification program helps campus offices of any size to become more sustainable workplaces through a three-step certification process. The program is designed to give UW–Madison employees the information and tools they need to learn about sustainability, better understand the impacts of their practices, and create healthy and sustainable work environments. Join the Green Office program to become part of a campus community where sustainability is meaningful and widespread! 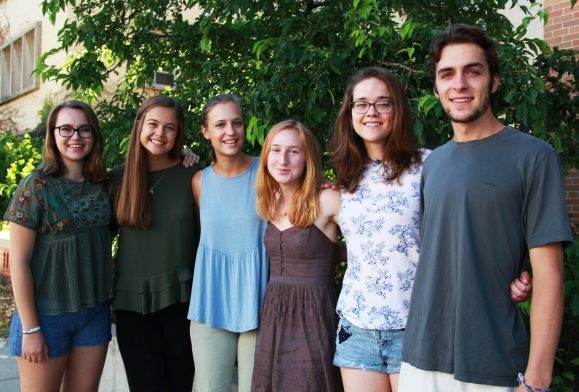 Green Office intern team, Summer 2018. What does a green office look like? Some ideas may spring to mind quickly: turning off lights, recycling, and using less paper—and these are a good start! But sustainability encompasses much more, from purchasing choices to employee health and wellness. The Green Office Certification consists of four levels. For each level of certification, participating offices receive an educational presentation from the Green Office team, a checklist of action items to complete, and a two-week check in to discuss their progress and move forward. Offices can take a step above and beyond at each level to achieve Platinum level certification. The Office of Sustainability is available as a resource throughout these steps. These certification steps won’t take up much of your office’s time, but can have meaningful and lasting impacts on our campus and community. The average certification process requires three 30-minute meetings over the course of 3 months, but can be adapted to your office’s needs. Begin your journey through certification now! Contact our Green Office Team to schedule an initial overview presentation. The OS interns will visit your office to give a short presentation (around 15 minutes) about the Green Office Program, how it might work for your staff, and why it is important for our campus community. We’ll then invite you to designate a Green Officer to lead your office through the certification process. The Green Office team will present to your entire office about sustainable practices and what sustainability looks like on our campus, beginning with the Bronze Level. They will give a short but comprehensive overview of how recycling works on campus and will answer questions you might have about office recycling. For each level, complete the action items on your checklist to make your office a more sustainable workplace. If you’re hoping to achieve Platinum certification, complete extra action items during each level. The Green Office team will check in after two weeks to go over your progress and answer any questions you may have. Typically, offices move on to the Silver Level after four weeks. To learn more or join the program, read on or contact our staff at greenoffice@lists.wisc.edu. We use hundreds of single-use coffee cups every day. Are you putting yours in the correct bin? See our recycling and compost pages for detailed information, follow us on Instagram for tips, and check out the video.